My first self-drafted crochet top! I've been very into warm weather crocheting and knitting lately. I don't know why, seeing as how it's pretty much never warm in Massachusetts. I used Knit Picks Comfy sport weight yarn in Lilac Mist and White. It's the lightweight version of the yarn I used for my Crocheted Scalloped Top. The curlicue detail around the neckline was inspired by this pattern. I used a different stitch pattern, a different yarn weight, and made a different size than the original pattern, so I had to draft the pattern for this top myself. By the time my top was done the only common factor between my sweater and the original is the curlicue around the neckline, which I knitted as a 3-stitch i-cord instead of crocheted. The details are all on my Ravelry Project Page. I finished this top except for the curlicue neckline in February but I had a hard time pinning the curlicue in a way that I liked and all of a sudden it was the end of May and I knew I just had to commit to something. The curlicues aren't perfect, but I kind of like it. Not in an "I'm too lazy to care about how this looks" kind of way, but I think it makes this top look handmade in a good way, ya know? It was hard to get a good picture of this top. It fits well and is very comfortable and is not as boxy as it looks in the photos. The nice thing about crochet is that the stitches often drape nicely without any waist shaping. I think the sleeve length, the way the sleeve fits into the armscye, the body length, and the back width are perfect. Drafting the pattern for the body of this top wasn't hard because there wasn't any waist shaping to worry about. I referenced some pattern drafting books for knitting regarding shaping the armscye and the set-in sleeve. I thought the sleeve would require a bit of finesse would cause me problems, but it came out beautifully the first time. 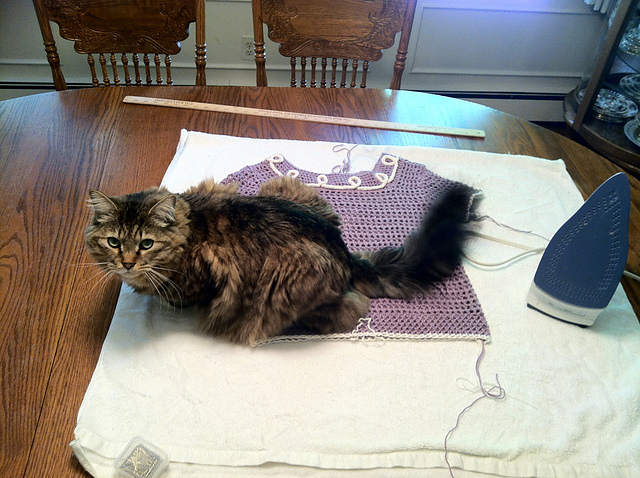 And of course Sox was there to help me get things blocked into shape. Its a really cute top and I can tell the Sox really loves it too! the lavender is so pretty!